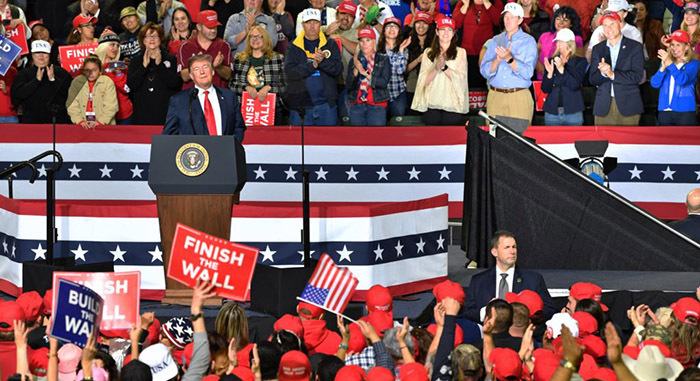 The British Broadcasting Corporation is asking the White House for a security review after a BBC cameraman was attacked at a Trump rally Monday night in El Paso, Texas. Camera Ron Skeans was unhurt after a Trump supporter wearing a trademark "Make America Great Again" hat jumped onto the media platform and started shoving him. BBC reporter Gary O'Donoghue said the man tried to smash the camera before he was restrained. He could be heard yelling profanities at TV reporters and crews as another Trump supporter pulled him away. President Trump paused, asked if everything was "OK," and continued his speech about building a border wall, and talking more about the "totally dishonest media." O'Donoghue says the attack came after Trump "repeatedly goaded the crowd over supposed media bias." White House spokeswoman Sarah Sanders said Tuesday "President Trump condemns all acts of violence against any individual or group of people, including members of the press. We ask that anyone attending an event to do so in a peaceful and respectful manner." British Foreign Secretary Jeremy Hunt said journalists should never be assaulted for just doing their jobs. "There is a broader issue here, which is that last year, 80 journalists were killed across the world. We are very worried about this," he said. A BBC bureau chief said there was no security around the media platform, and no policemen intervened during or after the cameraman was assaulted. The media has been one of Trump's chief targets for insults since he started his presidential campaign. He has berated reporters during news conferences, accused television networks of lying, and constantly refers to The New York Times -- the country's premier newspaper -- as "failing" and "gutless."